Taken during our field assessment in Nepal. Photography by Davian of RECKN Studios. The birthdate of Artisan & Fox isn’t exactly clear. I had the idea for Artisan & Fox in the summer of 2015, after a serendipitous meeting with artisans in the Nepali Himalayas. But our social business did not truly take off until last year, when we completed our crowdfunding campaign on Indiegogo. It’s been a year since we completed our crowdfunding campaign, with you and 290+ others worldwide giving your pledge of trust to us with US$26,000+ in pre-sales for the craftsmanship. This was a big validation for us that there were many who cared about the why, how and by whom their things were made, and that there is a demand for the beauty of the handmade as opposed to the mass-produced. We're also happy to see our team grow to collaborate with artisans beyond Nepal — in the slums of Nairobi, Kenya, to the old city of Kabul, Afghanistan, the fields of Mexico and Guatemala, and recently even with Syrian refugees in a Lebanese refugee camp. We've been meaning to keep you updated of our journey... and so here's some highlights of what transpired in 2017, and our thoughts of what it means to be an 'ethical' business. The crowdfunding campaign gave us a glimmer of what was possible. We re-launched our online artisan marketplace, now with craftsmanship beyond Nepal - we included extraordinary craftsmanship and artisans from Afghanistan, Kenya, Mexico and Guatemala, gave the marketplace a new look which is what you now see on the site. However, we'll soon be shifting platforms and giving our current platform a refresh. Over the past year, we were accepted into various networks which helped to accelerate our growth. We were awarded the Yunus&Youth Fellowship to learn more about the workings of a social business based on Yunus' principles, a program for which we eventually won Best Social Business pitch, too. The United Nations Sustainable Development Solutions Network also featured us in their inaugural Youth Solutions Report. We also joined the Alliance for Artisan Enterprise (now the Artisan Alliance) launched by the Aspen Institute, registered with Singapore's social enterprise body raiSE, joined UNHCR's #WithRefugees Coalition and Green Is The New Black Asia. All these networks helped to build us up, bit-by-bit. We embarked on our next trip to discover and co-create with artisans - in Vietnam. Together with our local coordinator Ha, we visited artisans from north to south of the country, from bustling Ha Noi to the idyllic Cam Kim Islands. From visiting a century-old silversmithing family, to co-creating new tote bags with new age leather-makers, it was a deep learning journey for us as we learned to develop closer relationships with our artisan partners, and better appreciate the importance of proximity with those you wish to empower. We also better understood the diversity of artisans' capacity for production; some artisans had beautiful products but no processes to ensure quality or consistency, some artisans were trading by barter and did not even have bank accounts. Many factors mired some artisans in poverty, or staggered the growth of others to remain as informal micro-enterprises. We engaged in rapid product development with some makers whenever we could, be it improving a weave, customising craftsmanship's dimensions and colors, or even opening bank accounts. Our Vietnam artisanal collection premiered at Boutiques Fair Singapore last month, and we'll be bringing the artisans' craftsmanship on-site next week. 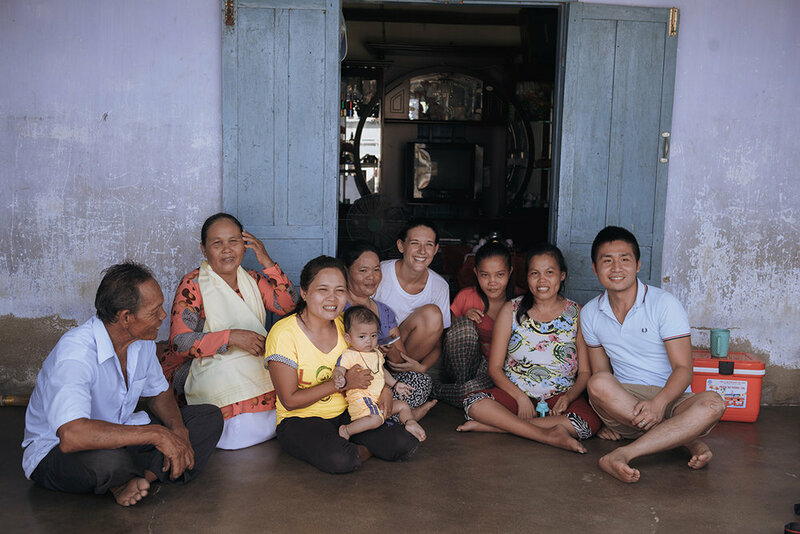 Laura and I with an artisan family in rural Vietnam. Photography by Ody. These ancient brocade textiles have been woven for centuries. Photography by Ody. A visit to the beach with other tourists. Photography by Ody. Sourcing leather scraps from a local workshop with Bella (Ha) and Laura. Photography by Ody. Hien working on one of the first prototype straw-weave bags. Photography by Ody. We also had some downtime for the beach and sun, rides on sand dunes, and a stroll down Vietnam's flowing lakes. While representing Artisan & Fox at the UNLEASH Innovation Lab in Denmark last August, I was introduced to Dana of Tight-Knit Syria, with whom we began developing a partnership for Threads Of Syria. Fast-forward 1 month later, I found myself in Beirut with Dana and her team, working with 25 Syrian women refugees in Chatila camp for our new collective project. We launched the first not-for-profit Threads Of Syria line of knitted scarves in November with some small fanfare, and I'm proud of how our small team managed to launch a new collection in just 6 weeks - just in time for Christmas. Moving forward, we're looking to improve the women's production capacity (given their status as homekeepers, and how they face precarious circumstances in the camp) and are furthering product development with the Syrian women this year to co-create new items with a distinctive Syrian touch. There's also perhaps a video-collaboration with UNHCR in the near horizon, and a VR-video with HiverLab. Malak holding one of the first Syrian Scarves. Photography by yours truly. This form of cross-stitch embroidery is distinctly Syrian. Photography by yours truly. The Chatila skyline, taken off a rooftop of one of the concrete buildings. The homes are mostly precariously built without any foundations. Photography by yours truly. Working with refugees have been very different, and much more expensive than our work with other artisans. All of the women refugees are financially excluded, they do not have access to traditional banking. The sourcing of raw materials are difficult - we find it difficult to source materials from within Lebanon, or from around the region, and the infrastructure of the camp mostly lacking for any effective trade to take place across camp borders. Payments to the refugees have been often declined by most companies when we try to send funds through. In the grand scheme of things, we do realise that we're unlikely to change much at all about the Syrian crisis and regime. Our understanding of the region's politics is meagre at best. But we still want to play our small part, apolitically, in providing dignified economic opportunity to Syrian women refugees, and in changing the narrative around refugees as active, untapped talents. We believe in the power and what it means to give refugees the means to be productive and self-sufficient again. We'd also like to thank these wonderful people who also gave their time to help: Verena of The Wool Club did an interview of us, and Holly Rose of Leotie Lovely gave us numerous shoutouts, as well as Hanna Pumfrey of flor + cesta, Joséphine Goube of Techfugees, and Kayla of This Little Wandering giving us time out of their busy schedules. As a wonderful surprise James Longman of ABC News, who used to be based in Beirut near Chatila - also gave us a shoutout after his thoughtful partner Alex got him one of these Syrian scarves for Christmas. All these helped to bring in more orders for the women - thank you! After a year of collaborating with women artisans across the globe - we began to better understand the issues they face in production. Many artisans are often faced with a liquidity issue, and do not have much working capital. Traditional micro-loans charge in excess of 30-40% interest rates and can trap people in debt cycles. So we decided to practice what we preach, and provide a way to finance and empower our women artisans. On International Women's Day this year, we announced the launch of Thrive Transfers, our flagship women micro-credit program with Womentum.io. These transfers will be sponsored by sales of selected craftsmanship on our site. One key difference between Thrive Transfers and Kiva loans is that the former does not accrue any interest for the women. I've been a big fan of Womentum's CEO Prabha's work for a long time coming, having written an article on HuffPost regarding Womentum's innovative pay-it-forward model last year, and we're grateful for the opportunity to partner up. Womentum will provide much-needed external auditing, administrative assistance, and funding support with their proprietary technology and due diligence processes. Fabiana and Isabel below are our first pilot fundees from villages in Guatemala. Fabiana is a 42 year-old weaver from a rural village in Guatemala. She has requested a sum of US$315.00 to purchase raw materials for a large order of woven pillow covers. Isabel is a 60 year-old weaver from the western highlands of Guatemala. She has requested a sum of US$275.00 to purchase raw materials for an advance order of Mayan shawls and placemats. Laura stepped down as co-founder to focus on her other ventures with Worship Your Clothes with acclaimed videographer Von Wong, Fashion Revolution and to provide social impact consulting full-time. We're glad to still have her part-time support with our impact assessments. If you'd like to tap into a truly ingenious mind on sustainability, she's also available for consulting projects now. Zee, Judith, Reenu and Videa also joined our team months ago, while we're also grateful to teammates Sy, Zon, Byron and Ody who were our go-tos for creative campaigns, branding and photography. So... what does it mean to be 'ethical' anyway? 'Ethical' companies are now a dime a dozen, and often many fall into the illusion of greenwashing much alike larger corporates. 2018 is about scaling up our revenues commercially, so that Artisan & Fox can raise even more artisans up the value chain, but it is also about deepening our roots socially, developing closer proximity with our artisan partners, and establishing a clearer impact assessment structure to set an example for artisan businesses. What does it mean to be 'ethical' when collaborating with independent artisans, co-operatives and other social businesses? In an unorthodox move we've benchmark 50% of profits for our artisan partners, and currently reinvest the rest of the profits into our social programs, but often we wonder if that's sufficient to truly empower artisans. This has limited our ability to raise investment, but this 'no dividends' rule has the same time has earned us loyalty from many of you. In any case, in 2018, we'll be working to improve the productive capacity of our artisan partners, and when possible, help them grow and expand their businesses - through financial inclusion, knowledge sharing, trends forecasting and more. What does it mean to be 'transparent', too? Many companies have gone for the Everlane-route of transparency, publishing approximate cost breakdowns and behind-the-scenes view of their factories, but the line between 'radical transparency' and using this as a marketing gimmick is often a blurred one. At times, a company like H&M can be even more transparent than Everlane, as this article shows. There is also often no due diligence done on the smaller companies, which naturally do not have the means to apply for factory certifications. So how do we actually know that the numbers and pictures are true, and even if the numbers are right, that they tell the true anthropological story? Lastly, it's been a challenge to incorporate 'sustainability' into our work with the artisans. The handmade process is insufficient to be considered de facto sustainable if the artisan works with chemical dyes or materials considered unfairly sourced. We've received animosity for onboarding artisans producing leather goods as these are not vegan products - but who are we to say no to makers who've been working with leather for centuries? Indeed, some makers are also naturally sustainable and eco-friendly through no merit of our own, as they may already work with all-vegan materials before we came in with our collaborative efforts. The latest innovations in sustainability also often do not extend to a refugee camp, or villages in South America. Most artisans do not have the capacity or funds to experiment with closed-loop bamboo Tencel, or incorporate trendy technologies like 3D-printers, recycled ocean plastic threads or the numerous types of fruit leather you have now. On a lake in Nepal during one of our fieldtrips. Photography by Sy. In the face of all these uncertainties, we'll be launching our first Impact Assessment Report next week, with an assessment structure and guiding framework developed with our ex-co-founder Laura, supported by myself and our Impact Analyst Reenu - to take an honest look at these questions. We'll be taking a deep dive into ethics, transparency, and sustainability, and what it means to be an ethical, transparent and sustainable marketplace in the artisan space, a sector that is the second largest employer in developing nations, but risks being left behind in the Fourth Industrial Revolution. Lastly, thank you to all those who have joined our team over the last year. You have played no small part in our journey so far: Laura, Judith, Zee, Sy, Bella, Lucky, Ody, Jovin, Zon, Davian, Videa, and Reenu.